This week I want to talk about something a little less "show and tell" and a little more "confessions of a planner addict". Maybe you've been here, maybe you haven't. Either way, I hope you can take something from my mistakes. When I first started my Bullet Journal, I was approaching it as a way to increase productivity and organize all the millions of thoughts I had running through my head. I made lists galore, created routines, schedules and trackers, and meticulously counted the little dots in my Leuchtturm1917 to ensure a perfectly symmetrical layout. With all this structure, it wasn't long before I started feeling pressured to achieve the "perfect" day or the "perfect" layout. If I wanted to start a new collection in my Bullet Journal, instead of creating it right away, I put it on a growing list of collection ideas. There it sat with the others, waiting for me to come up with perfect layouts. I couldn't even keep my collections list as a proper collection in my Bullet Journal! I relegated it to a sticky note stuck on inside cover of my notebook because I couldn't come up with a cute header. I'm sure I'm not alone here either. After all, we all know what it's like to have this shiny new notebook and be terrified of ruining it with one ill-planned layout or doodle. My poor little list of potential Bullet Journal collections, all off by itself in a sticky note at the front of my Bullet Journal. Even my habit trackers started to become more of a daunting reminder of imperfection than a friendly nudge. Slowly but surely, the guilt grew. 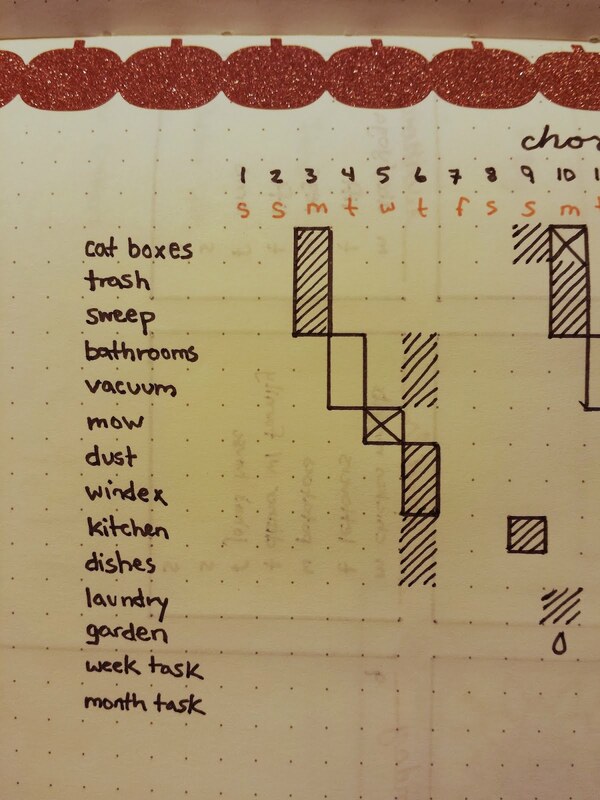 The quest for perfection was slowly eating the joy of Bullet Journaling alive and leaving me creatively paralyzed. 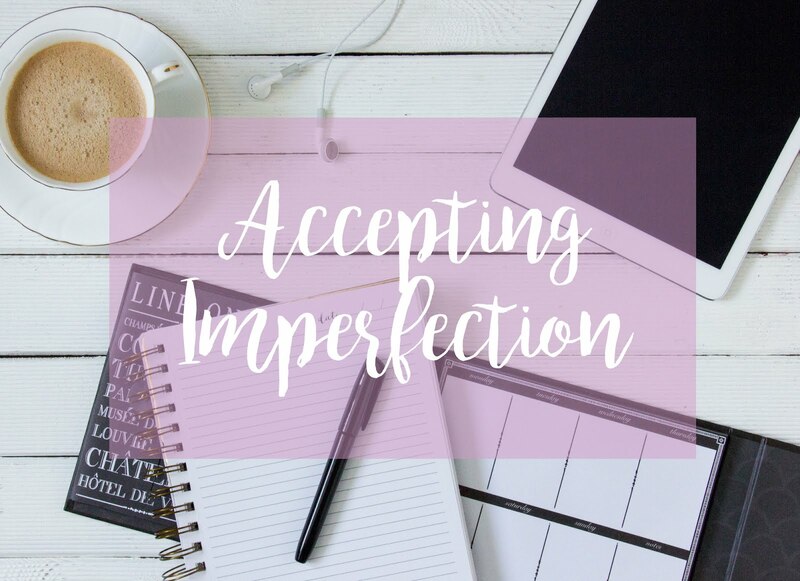 But perfectionism isn't what Bullet Journaling is supposed to be about. 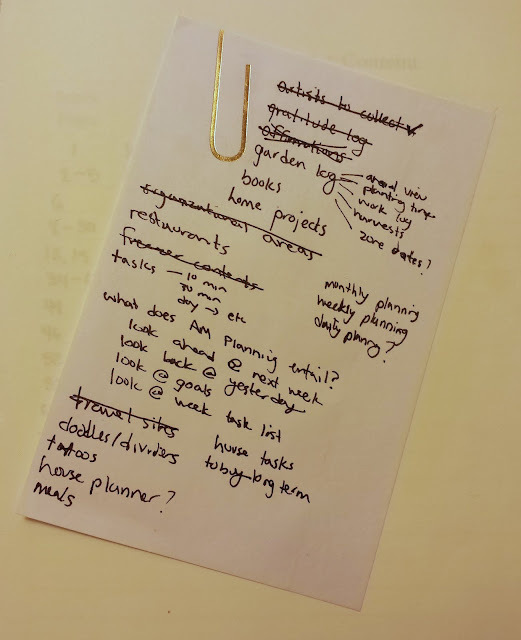 Eventually I stepped back and realized how afraid I was to put pen to paper and how anxious I was starting to feel about my habit trackers and daily task lists. I knew I needed to adjust my priorities. With all the amazing Bullet Journal spreads on social media, it's incredibly easy to feel the pressure to create "Instagram-worthy" layouts. Don't get me wrong -- The Bullet Journal community has been both extremely helpful and hugely inspirational as I've begun this Bullet Journaling adventure. I'll probably still occasionally spend good chunks of time creating detailed spreads with lots of decoration. However, I am also going to work on remembering that it's completely acceptable to just throw something onto paper when needed. Form follows function, after all. As for all my routines, schedules and trackers, I am learning to view these as guidelines rather than strict dictators. In particular, this past week took a very different path than I originally envisioned. Nights I planned on being home ended up spent elsewhere and other events ended up cancelled. I spontaneously took a day off work to go to a popup Luke's diner (a Netflix Gilmore Girls reboot promotion. SO. EXCITED.) and then spent the rest of the day shopping. I skipped a planned workout and was late publishing last week's post because I missed my writing times. But you know what? I had one of the best weeks I've had in awhile. I saw friends I hadn't seen in a month, picked up some things I've been desperately needing, got some cute new autumn outfits and had a couple great dinners with some wonderful people. And in the end, I got everything done that I needed to. I did my household chores on different days than normal, and I had to write well into the weekend, but it all worked out. I enjoyed the spontaneity of the week without the guilt. Conquering the tendency toward perfectionism won't be easy. I'm sure I'll occasionally get sucked back into past mindsets, but I hope to put some measures in place so that I remember to see the value in the unexpected. Instead of tracking only tasks and events, I am going to make a point to note moments. Not just happy or good moments -- anything of significance, whether good or bad. As I've mentioned before, I have been trying to live more mindfully. Taking time to write down my experiences and feelings will not only help me be less task-oriented but will also be yet another way to incorporate mindfulness. Lastly, I want to encourage myself to take more creative risks. I used to do a lot of drawing for university classes, but I stopped during my last few years. I think one of the best ways to vanquish this creative paralysis is to just jump right back in. Take a dive off the high-board right into the deep end, shall we say. I am going pick my drawing habit back up. And just to really drive home the importance of creativity for creativity's sake, I'm going to do it in my brand new, pristine, unsullied Bullet Journal. Wish me luck! What kinds of things do you do or remind yourself of to keep your planning from overtaking your life?